We have managed to take some photos in the small moments we have had to make a Tutorial so you can guide a bit of how we have come to make this decoration with Hawaiian air. 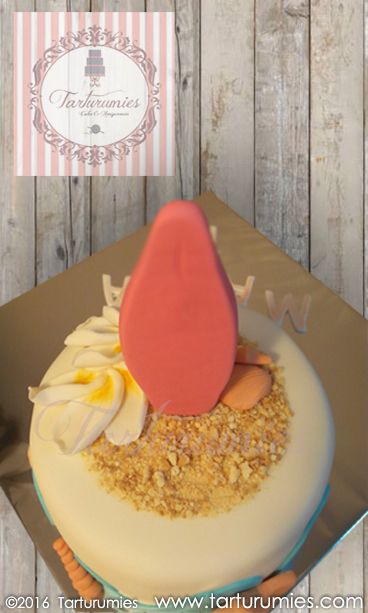 1st and 2nd Step: Make fondant figures such as snails, starfish, Hawaiian flowers and of course a surfboard that can not be missing for decorate, put a brochette stick to the surfboard while it is fresh (careful not to Transfer to the other side) to have it ready for when to decorate. Allow to dry all figures well. Step 3: Have made the cakes with their filling, cover with chocolate ganache or with what they usually do. Step 4: Cover the cake with fondant, in this case we have chosen the white base color. Step 5: Stretch fondant of light blue color with a length that matches the diameter of the cake. We cut with the aid of a cutter making waves. Once the figure of the sea is made, paste with a little bit of edible glue around the cake as the image indicates. Step 6: Using a ring with a diameter smaller than the cake and a little edible glue, paste crushed cookies to simulate a little sand on the top. (If you do not want to put edible glue they can also use a little mermelade or whatever they have to paste usually in these cases). Step 7: To finish, nail the surfboard in the center and paste the rest of the figures of the decoration guided by the image. Ready!!! 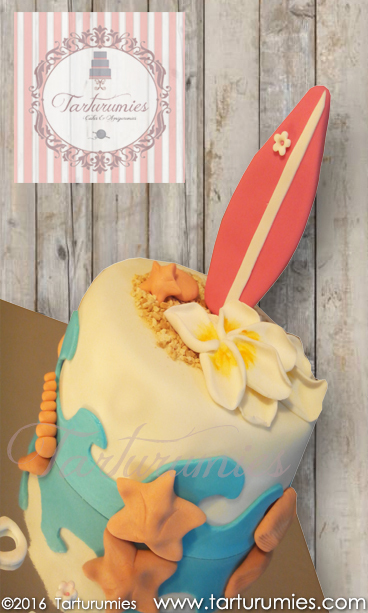 A simple, fresh and original cake for all lovers of the waves … To enjoy it!